Kelly discovered her love for skiing on a trip to Andorra when she was 17 and in August 2009, she made her international debut at the Winter Games in New Zealand. The following year she was selected for the British team and made her Paralympic debut in Vancouver, making her one of Northern Ireland’s first athletes to compete in the Winter Paralympics. 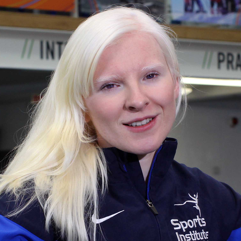 Kelly has oculocutaneous albinism and is visually impaired meaning she competes with a sighted guide, Charlotte Evans, England.